We were overdue for a threadnaught, and CCP Greyscale delivers in the form of the proposed jump drive changes. Null-security space is stagnant, he tells us, as though we didn’t already know that, and he is beginning with a giant step (or the opposite of one, really). The addition of jump fatigue and cooldown timers will seriously slow force projection. The goal is to make the enormous, headline-making battles less feasible and less well-attended, the theory concluding that EVE will be more interesting. Surely this will be the case. Imagine a Roman Empire suddenly lacking in those fantastic tools of conquest, the roads. Legions less able to cover ground rapidly are less able to enforce Imperial law in the provinces. Imperial might and the myth of its divine origin lose the ability to awe the citizenry, conquered peoples and rival empires. An empire built on military might–as they all are–weakens and eventually crumbles. Other CCP plans will affect sovereignty in many ways, but even a hisec bear such as I can foresee a nigh-inevitable end to the era of the Space Emperor. At the very least, additional Doughnut resources (time and ISK) will be taken up in logistical planning, strategy and diplomacy. I don’t know whether the jump-drive nerf must necessarily spell the demise of CFC, but it’s going to make for hella interesting behind-the-scenes sov struggles. CCP is tuning our EVE experience. What if the moods, health and welfare of your neighboring friends and enemies suddenly became more important than the edicts handed down from a distant Doughnut Throne? What happens when the Gauls begin to feel more Gallic than Roman? The result? Maps redrawn. The destabilization of nullsec through some sort of nerf to force projection is the sort of thing I’ve predicted and hoped for (without having had a clue as to how to accomplish it), for the sake of GrrGoons as well as for the rest of us. Their wars will be less CPU-throttlingly spectacular, less exercises in Teamspeak endurance than grand strategy and rapidly-evolving tactics. The Art of War more than War Gratia War. Null governors, de facto kings owing less fealty to an Emperor, will be seizing, trading and squabbling over renters, capital ships and moons they once shared. NBSI will evolve into NRDS. Alliances will split from coalitions and corps from alliances. Toons will leave null to be replaced by others drawn by the new face of war in New Eden. The wily old Space Emperor will clutch at power, alienating some alliances to gain or retain others. Dogs and cats living together! Turnover is what we’re talking about, turnover and interesting war. More battles and more FCs. Hope the Space Emperor is up to the challenge. He’ll be playing a new game, as will everyone else. I don’t want to see CFC destroyed, mind you; I want to see them earn their legend, and earn it again every goddamned day–or make way for those who will. Their forum swagger will become more than empty bluster, as will that of their new rivals. More who-the-hell-are-these-guys will be seen in Local. There will be battle reports I’ll actually read. Thanks, CCP. I believe you’ve figured out how to think big by thinking small. Great idea. A bridge between Tranquility and Serentity? Chinese players able to interact with those in other countries? That a theme Art has touched on, and he hits it again this week. It’s an idea to fire the imagination, and perhaps the coolest notion of all is that of new (to us) players chattering in an alien language in some of the same comm channels. Yeah, I can see why this is desirable; cross-pollination has to be a good thing, right? ‘Tis a consummation devoutly to be wished, all right. World gamers getting to know their Chinese counterparts couldn’t help but defuse the international tensions willfully (or otherwise) deepened and prolonged by the current segregation. Well, if it happens, it’s not going to be accomplished by CCP. Standing between us Tranquilitarians and the Chinese is The Great Firewall, a technological and political barrier that we barbarians are not going to be allowed to scale anytime soon. It’s unfortunate, but Chinese authorities are not going to permit ISK transactions and uncensored chat. Heck, we’d be lucky to be able to pass EVEmail back and forth; forum wars and ISK trading aren’t about to happen, either. The barrier’s not insurmountable, but CCP isn’t going to tear down this wall. Even if they had the permission from the People’s Republic, there would remain a last hurdle: sharding. Chinese players on Serenity aren’t playing in different space; they’re on a clone of the universe we inhabit. Serenity, like Singularity, is filled with the same star systems we see on Tranquility, with (presumably) the same divisions among hi-sec, losec, null and w-space. As amusing as it would be to watch an attempted merger of CFC sov with its Chinese counterparts, that’s not a task CCP is going to undertake. Did I say that was the final hurdle? Strike that. The ultimate concern is budgetary. The desirability of international brotherhood aside, there ain’t no money for trying to merge what was sharded by design. The new space to which our player-owned stargates will bridge us is not going to be on Serenity–not until the government of China changes. Or changes its mind. A few thoughts crystallized today on the heels of Kirith Kodachi’s excellent tea-leaf analysis (go read it now) of everyone’s favorite new trailer, and I am ready to tell you what it all means. I’d been looking at the trailer in the wrong light, so to speak. No doubt it is a vision of the future; how could it be anything else, with EVE, DUST and Valkyrie toons working together? That’s the usual rah-rah, as Kirith notes, and its realization is coming Real Soon Now, along with WiS.
What it isn’t is a story waiting to be told. This isn’t a picture of those new stargates everyone’s going to be constructing next year. Oh, no–commence primary illumination! This is an event which has already happened. That new space we as players know we’re going to get access to? What we see in the trailer was the first large-scale attempt to access that space, over a year ago. The action tells us that that first gate experiment was a failure. Or, as the engineering world has it, a qualified success. The professional robe-wearer and utterer of gnomic prophecies wasn’t just repeating sonorous nonsense. Let’s posit that the prophecy is more or less on the money, in that vague way that the best foretellings have of being. What is “more primordial than the elements themselves” that could also be described as a storm? The Primordial Soup, that’s what. The ultimate chaos in which everything and nothing existed. The Theology Council and the old Empire were manifestations of order, and this superduperprimordial chaos is exactly the sort of thing that mature, bearded and robed men who utter prophecies professionally would despise and fear. It would be the ultimate heresy, and the immortal people who tried to activate this gate were therefore the ultimate heretics. The Amarrian fleet didn’t hot-drop in to seize control of the gate, but to destroy it. A key to new worlds, and therefore riches? Power blocs everywhere would want to own it…except for those tied to dogma forbidding it. Fast-forward one year. Records have been analyzed. Survivors of the gate fiasco, or its architects, have determined what went wrong. This new space can be accessed safely if the theories hold up, but new tech is needed to do it, tech capable of withstanding the most powerful force ever thought to exist. That means new research conducted in secret. That’s right; I’m talking about the ghost sites. Not only are they training us in how to crack relics and explore space. They are our means of getting there, or will be when those scientific and engineering projects conclude. By then, the knowledge will be too widespread for any one fleet of Amarrian fundamentalists to stop. No wonder we capsuleers were warned away. Other capsuleers have opined or implied that the new space is a way back to Terra. I don’t know about that, but if other prophecy can be believed, the journey will be costly (“the appetite of nothing expands over the world”). Perhaps this Prophecy trailer showed us that fourth event. If Terra is in our future, we won’t like what we find (“the little brother makes the final sorrowful steps home; he is not welcome”). The possibility of Terra interests me less, I think, than the space we would traverse to get there. 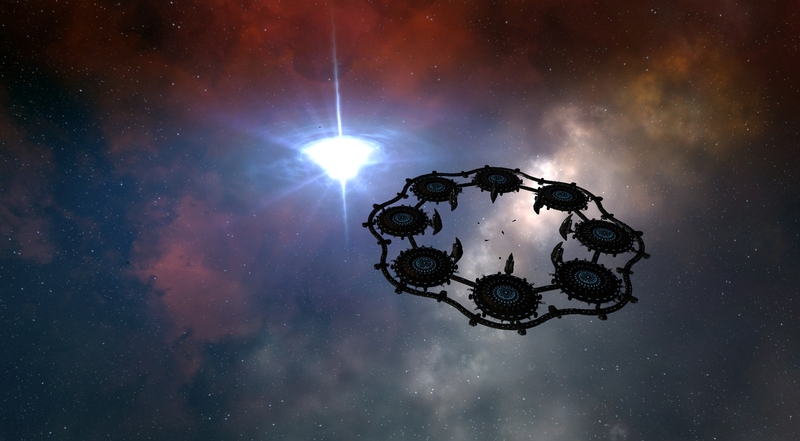 I like to think that CCP will take the opportunity to introduce a multi-shard architecture that doesn’t require the Band-Aid of Tidi. A mass player emigration (or Diaspora, maybe, if the new gates are as ultimately destructive as prophesied) would be the time to rebuild the game. The “entity” of the prophecy? I think it’s the Soup, but I also think that it’s only a barrier to our entering the space, and one which we are going to breach next year. You veterans of Odyssey who took seriously that expansion’s call to learn the art of exploration are almost ready. You will map the new space that the battle-fleets, diplomats and industrialists will tame.